Developing new customers and maintaining current ones is challenging enough. Why not make the process easier by complementing your presentations at meetings, speaking engagements, and networking events with presentation folders that will make your message and key selling points more compelling and memorable? You can choose from a variety of typestyles and imprint colors to match your personal, conservative style to create a lasting professional image. 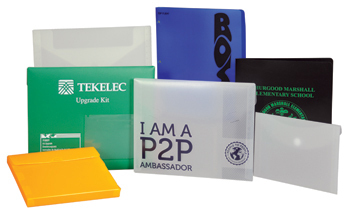 Presentation folders are ideal for holding files, notes, presentation materials, certificates and other important documents together so that you can keep your name at their fingertips. These folders will definitely complement your conservative style. Create yours today. Promote your company and watch your sales and exposure soar to new heights! There are many ways to promote your company, and a Custom Document Holder is a great way of achieving this for travel agencies, schools, insurance agents, and automotive companies. Take advantage of our superb selection of Document Holders that will keep all of your essential travel documents together, safely and securely. So whatever the occasion may be, corporate meetings, conferences, vacations, etc., be sure to promote your company with these promotional travel document holders while making it easier and less stressful for the traveler. Give your employees and customers the travel document accessories that will increase your company’s market exposure, and make them your brand allies! Decoration options include full color digital printing, screen and litho printing. Foil stamp, embossing, debossing are also available.